We picked up a box of magnificent President plums at the markets last week. They’re very tart and firm, which makes them perfect for cooking. After freezing twenty-four plums (stoned and halved, vacuum-sealed), Pete had enough left over for a couple of batches of jam. His first was a delicious plum and pluot blend, but this second one is even better – sweet, but tart, with a wonderfully complex flavour. It will make a great staple in our larder for the year to come. 1. Put the quartered plums in a large wide stock pot. 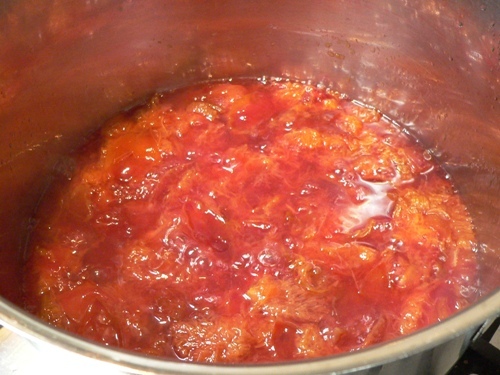 Ensure the pot is big enough to allow the jam to rise up as it boils. Add the lemon juice and pectin, cover and bring to a boil. Don’t add the sugar yet. 2. 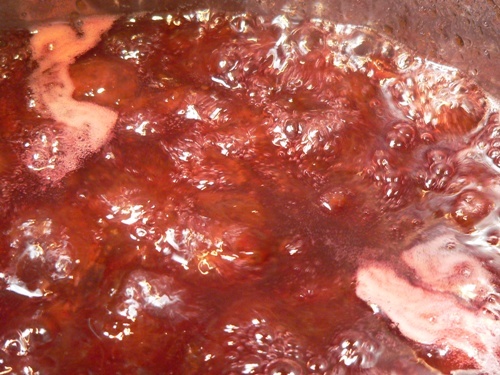 Stew gently until the plums are softened, about 15 – 20 minutes. Note that the plum skins won’t soften any further once the sugar is added. 3. Add all the sugar and vanilla extract and bring the mixture to a gentle boil. 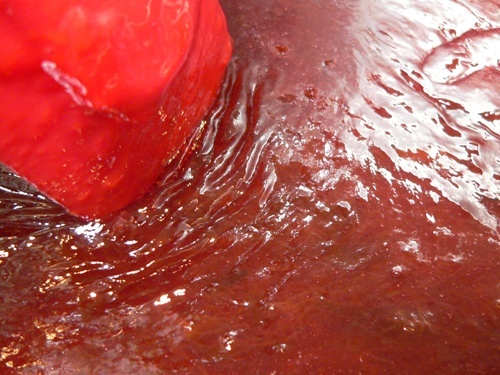 As the sugar dissolves, foam will appear on the surface of the jam – skim this off carefully. Put a small saucer in the freezer so you can test the jam for set. 4. Once the jam is clarified, raise the temperature and bring the pot to a rolling boil. Cook until the jam has thickened, then place a spoonful on the cold saucer and allow it to cool. If it has set properly, it will wrinkle when pushed. Plums, if they’re not too ripe, have a high natural pectin content, so they usually set very well. Here is a photo of the pot once it had cooled slightly. 5. Ladle the jam into sterilised jars, seal tightly and process in a boiling water bath for 10 minutes. For more instructions, please refer to our Jam Making Primer. How interesting, looks beautiful! We usually leave the pits in as they add extra flavour and pectin and then fish them out, screaming loudly as we burn our fingers. My aunt even adds a few of the cracked kernels in to get a little almondy/cyanide (yes that is what is in them, so understand if you decide not to!) complexity to the taste, ditto with cherries, but they are full of pectin anyway! I once made plum jam and used ‘jam sugar’ and the stuff set like concrete! If you can get anything like the little damson or sour plums that we get in Europe have a go with those too as they make the most amazing jam. The sourer the plums the better the jam seems to be for some reason! Jo, Pete just made the most delicious plum sauce from these as well! Would Brian like the recipe? I’ve never had luck with jam sugar – like you, the one time we used it, the jam set like a rock. Apparently these sour plums are also known as “German plums”. They’re just so good for cooking, and so fresh at the moment – we met the grower at the markets, and he said he’s picking them every week and taking them straight to sell – no cold storage. Too sour for me to eat, but Pete loves them dusted with vanilla sugar. oh, celia, that looks wonderful! i love plum jam, all my childhood i’ve eaten this soft-set italian plum version, of a rich burgundy foretelling its delicious taste. i’m going to read the jam primer immediately, come summer i’ll be making my own. thanks a lot for the link!! i’ve ordered the nw starter, can’t wait to try my hand at sourdough! have a great week! Dana, these plums are very like the Italian plums – that’s what we thought they were to start with, but we chatted with the grower last week and he told us the correct name. 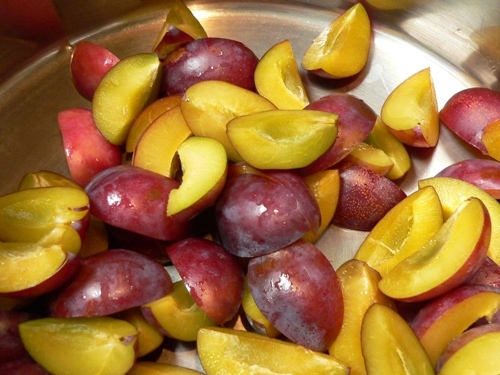 Often plums have so much pectin in them that you don’t need to add any to set the fruit, just lemon juice and sugar. That’s exciting that your NW starter is on its way. The only tip I can give you is to make sure you get good bread or bakers flour. If you use all purpose, the results might be disappointing, and discouraging, because the flour lacks the necessary protein glutens to rise well. Have fun! Ooooh, plum jam! 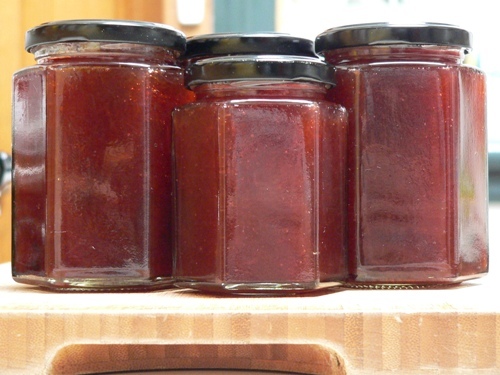 That was my first foray into jam-making, thanks to a huge load of free plums from my uncle. 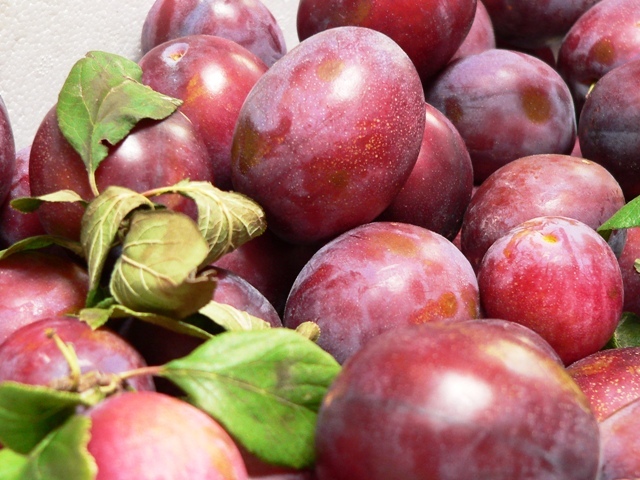 Delicious and I had never had it before–plum jam isn’t very commonly found in US supermarkets. Nancy, that IS surprising – I always assumed plum jam would be big in the US, since so many varieties are grown over there! Dana – welcome to the world of sourdough baking. I see that Celia has managed to ‘infect’ you too with this craze. Yeah I did get 100kg of flour delivered a few weeks ago – sounds far more obscene than it is though! Half was for other people….a quarter I gave away to friends who were interested in trying sourdough baking, and the rest sits snugly in my freezer awaiting my twice weekly baking sessions. Since I met Celia and started on this journey, I too have been making all the bread we consume at home. We all love it so much! Reading this article and seeing those images really made me hungry. I like plum and it is really good to have it with bread. I came across your recipes by accident looking for a method to make homemade pectin from crabapples. I’m new to making jams and jellies with homemade pectin. I just finished making crabapple pectin and was experimenting with making jelly. The results were wonderful! Thanks for the valuable info! I’m so excited with how my jelly turned out! I want to make some plum jam but I’m wondering why you use the vanilla extract in the jam? Is it to bring out the flavor of the plums? Can I use store-bought vaniila extract? I don’t have any self-made but I will give it a try, after reading how you make yours! Thank you for all the valuable info and tips!